Murania Press » Silent Serials Book Set: Just Two Left! Silent Serials Book Set: Just Two Left! 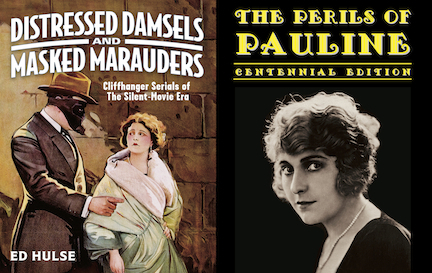 Last week, as the result of an overstock situation, I offered two-volume sets of Murania Press books dealing with silent-era movie serials: Distressed Damsels and Masked Marauders, a history of the form, and The Perils of Pauline: Centennial Edition, our reprinting of the 1914 novelization of the classic chapter play that made Pearl White an international star. I priced the set at $40.00 (which included shipping to domestic buyers), a savings of 20 percent off the combined list price of those books. To my surprise, all but two of the overstocked sets have sold, so if you were thinking about getting one, this is your last chance. The overstocked copies available at a discount are long gone, Frank, but you can still purchase the books individually at list price ($29.95 for DD&MM, $19.95 for Pauline, postage included) by going to my “Books” page and using the Shopping Cart function to buy via Paypal.